Can Josephine's Famous Foods save Fall River? "I just wanted to let you know Josephine's Foods is now selling our own Fall River Style fried Chow Mein Noodles. If I must say so myself they are absolutely delicious!! Same shape and crunchy taste we have all grown to love. Wasn't in the plans but we need to keep it going. Too many lovers of Fall River Chow mein so this favorite will and MUST continue. New pictures of our noodles will be on our site sometime today. We are good friends of the Wongs and they have been very supportive of our business throughout the entire process wishing us success all the way through. I think they would be pleased to know someone stepped in during such a tragic time to make sure people can still enjoy this long standing favorite dish." Please visit their Web site at http://www.josephinesfoods.com/ for more information. JUNE 18, 2009: The Oriental Chow Mein Co. has been destroyed by fire. Click here to read the article published in The Herald News. To honor the late chow mein noodles, we are reposting our Bite of the Week from March 8, 2009. Let's hope that the Wong family can reopen their business and continue providing Fall Riverites with this wonderful product. MARCH 8, 2009: Fall River is known for many things. We are the home of Lizzie Borden, Emeril Lagasse, the Battleship Massachusetts, and our very own chow mein mix manufactured by the Oriental Chow Mein Company right here on Eighth Street. My family has been eating Hoo-Mee Chow Mein for as long as I can remember. Mom even said that she remembers my grandfather bringing home boxes of it when she was a kid. The company has been in business since 1926, and I'm surprised that we haven't featured this earlier. After all, we Fall Riverites are obsessed with chow mein. When China Royal was closing its doors, the whole city came together in mourning. I unfortunately had the experience of eating chow mein that wasn't from The Riv. When I worked in Taunton, I ordered a small chow mein for lunch from a local restaurant. What I received was a Styrofoam container filled with dry, round noodles, and limp, wet vegetables. Where were the dark noodles? The brown sauce? The delicious flavor? Well, they certainly weren't in that Styrofoam. When I complained to my fellow co-workers, who were from the Brockton/Bridgewater area, they had no idea what I was talking about. That chow mein was the only chow mein that they had ever seen. They had no idea what they were missing! Even when I told them about the brown sauce, one of them said, "Like ... soy sauce?" NO! Not like soy sauce! I guess you just have to grab a box of Hoo-Mee and see for yourself. THE VERDICT: Delicious. 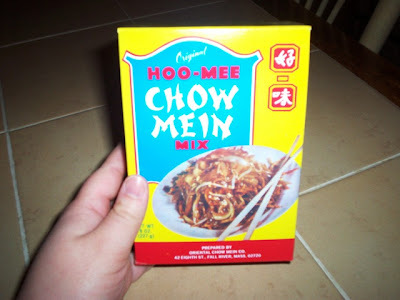 The Hoo-Mee mix is very simple to prepare, and tastes almost as good as getting an order from one of the local Chinese restaurants. The noodles are dark brown and flat, and the spice packet is more like a gravy than a sauce. Around here, you can find it in the "ethnic foods" section of the supermarket. If you visit the Oriental Chow Mein Company, you can buy the chow mein noodles and spice packet separately by the pound. This is nice if you have a big family or if you're cooking for a lot of people. If you live outside of Fall River and would like to try Hoo-Mee, along with other Fall River specialties, visit A Taste of Fall River. Believe me, I'm serious when I say that people come from all over to have this chow mein. My poor aunt unfortunately had "the other" chow mein on a recent trip to Bristol, RI. I think we should send her a box of Hoo-Mee. PS - Boxed chow mein noodles can also be helpful when parenting your children. Years ago, while I was being bratty during a grocery shopping trip to Valueland, my mother hit me with a box of chow mein. Needlees to say, my attitude changed immediately. I still have nightmares.